TINT low-level radioactive waste barrels. Radioactivity naturally decays over time, so radioactive waste has to be isolated and confined in appropriate disposal facilities for a sufficient period until it no longer poses a threat. 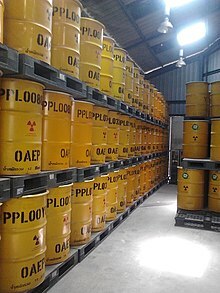 The time radioactive waste must be stored for depends on the type of waste and radioactive isotopes. Current approaches to managing radioactive waste have been segregation and storage for short-lived waste, near-surface disposal for low and some intermediate level waste, and deep burial or partitioning / transmutation for the high-level waste. A summary of the amounts of radioactive waste and management approaches for most developed countries are presented and reviewed periodically as part of the International Atomic Energy Agency (IAEA) Joint Convention on the Safety of Spent Fuel Management and on the Safety of Radioactive Waste Management. Radioactive waste typically comprises a number of radionuclides: unstable configurations of elements that decay, emitting ionizing radiation which can be harmful to humans and the environment. These isotopes emit different types and levels of radiation, which last for different periods of time. The radioactivity of all radioactive waste weakens with time. All radionuclides contained in the waste have a half-life—the time it takes for half of the atoms to decay into another nuclide—and eventually, all radioactive waste decays into non-radioactive elements (i.e., stable nuclides). Certain radioactive elements (such as plutonium-239) will remain hazardous to humans and other creatures for hundreds of thousands of years. Other remain hazardous for millions of years. Thus, these wastes must be shielded for centuries and isolated from the living environment for millennia. Since radioactive decay follows the half-life rule, the rate of decay is inversely proportional to the duration of decay. In other words, the radiation from a long-lived isotope like iodine-129 will be much less intense than that of a short-lived isotope like iodine-131. The two tables show some of the major radioisotopes, their half-lives, and their radiation yield as a proportion of the yield of fission of uranium-235. The energy and the type of the ionizing radiation emitted by a radioactive substance are also important factors in determining its threat to humans. The chemical properties of the radioactive element will determine how mobile the substance is and how likely it is to spread into the environment and contaminate humans. This is further complicated by the fact that many radioisotopes do not decay immediately to a stable state but rather to radioactive decay products within a decay chain before ultimately reaching a stable state. Depending on the decay mode and the pharmacokinetics of an element (how the body processes it and how quickly), the threat due to exposure to a given activity of a radioisotope will differ. For instance iodine-131 is a short-lived beta and gamma emitter, but because it concentrates in the thyroid gland, it is more able to cause injury than caesium-137 which, being water soluble, is rapidly excreted through urine. In a similar way, the alpha emitting actinides and radium are considered very harmful as they tend to have long biological half-lives and their radiation has a high relative biological effectiveness, making it far more damaging to tissues per amount of energy deposited. Because of such differences, the rules determining biological injury differ widely according to the radioisotope, time of exposure and sometimes also the nature of the chemical compound which contains the radioisotope. Radioactive waste comes from a number of sources. In countries with nuclear power plants, nuclear armament, or nuclear fuel treatment plants, the majority of waste originates from the nuclear fuel cycle and nuclear weapons reprocessing. Other sources include medical and industrial wastes, as well as naturally occurring radioactive materials (NORM) that can be concentrated as a result of the processing or consumption of coal, oil and gas, and some minerals, as discussed below. Waste from the front end of the nuclear fuel cycle is usually alpha-emitting waste from the extraction of uranium. It often contains radium and its decay products. Uranium dioxide (UO2) concentrate from mining is a thousand or so times as radioactive as the granite used in buildings. It is refined from yellowcake (U3O8), then converted to uranium hexafluoride gas (UF6). As a gas, it undergoes enrichment to increase the U-235 content from 0.7% to about 4.4% (LEU). It is then turned into a hard ceramic oxide (UO2) for assembly as reactor fuel elements. The main by-product of enrichment is depleted uranium (DU), principally the U-238 isotope, with a U-235 content of ~0.3%. It is stored, either as UF6 or as U3O8. Some is used in applications where its extremely high density makes it valuable such as anti-tank shells, and on at least one occasion even a sailboat keel. It is also used with plutonium for making mixed oxide fuel (MOX) and to dilute, or downblend, highly enriched uranium from weapons stockpiles which is now being redirected to become reactor fuel. The back-end of the nuclear fuel cycle, mostly spent fuel rods, contains fission products that emit beta and gamma radiation, and actinides that emit alpha particles, such as uranium-234 (half-life 245 thousand years), neptunium-237 (2.144 million years), plutonium-238 (87.7 years) and americium-241 (432 years), and even sometimes some neutron emitters such as californium (half-life of 898 years for Cf-251). These isotopes are formed in nuclear reactors. It is important to distinguish the processing of uranium to make fuel from the reprocessing of used fuel. Used fuel contains the highly radioactive products of fission (see high level waste below). Many of these are neutron absorbers, called neutron poisons in this context. These eventually build up to a level where they absorb so many neutrons that the chain reaction stops, even with the control rods completely removed. At that point the fuel has to be replaced in the reactor with fresh fuel, even though there is still a substantial quantity of uranium-235 and plutonium present. In the United States, this used fuel is usually "stored", while in other countries such as Russia, the United Kingdom, France, Japan and India, the fuel is reprocessed to remove the fission products, and the fuel can then be re-used. The fission products removed from the fuel are a concentrated form of high-level waste as are the chemicals used in the process. While these countries reprocess the fuel carrying out single plutonium cycles, India is the only country known to be planning multiple plutonium recycling schemes. Activity of U-233 for three fuel types. In the case of MOX, the U-233 increases for the first 650 thousand years as it is produced by decay of Np-237 which was created in the reactor by absorption of neutrons by U-235. Total activity for three fuel types. In region 1 we have radiation from short-lived nuclides, and in region 2 from Sr-90 and Cs-137. On the far right we see the decay of Np-237 and U-233. The use of different fuels in nuclear reactors results in different spent nuclear fuel (SNF) composition, with varying activity curves. Long-lived radioactive waste from the back end of the fuel cycle is especially relevant when designing a complete waste management plan for SNF. When looking at long-term radioactive decay, the actinides in the SNF have a significant influence due to their characteristically long half-lives. Depending on what a nuclear reactor is fueled with, the actinide composition in the SNF will be different. An example of this effect is the use of nuclear fuels with thorium. Th-232 is a fertile material that can undergo a neutron capture reaction and two beta minus decays, resulting in the production of fissile U-233. The SNF of a cycle with thorium will contain U-233. Its radioactive decay will strongly influence the long-term activity curve of the SNF around a million years. A comparison of the activity associated to U-233 for three different SNF types can be seen in the figure on the top right. The burnt fuels are thorium with reactor-grade plutonium (RGPu), thorium with weapons-grade plutonium (WGPu) and Mixed Oxide fuel (MOX, no thorium). For RGPu and WGPu, the initial amount of U-233 and its decay around a million years can be seen. This has an effect in the total activity curve of the three fuel types. The initial absence of U-233 and its daughter products in the MOX fuel results in a lower activity in region 3 of the figure on the bottom right, whereas for RGPu and WGPu the curve is maintained higher due to the presence of U-233 that has not fully decayed. Nuclear reprocessing can remove the actinides from the spent fuel so they can be used or destroyed (see Long-lived fission product § Actinides). Since uranium and plutonium are nuclear weapons materials, there have been proliferation concerns. Ordinarily (in spent nuclear fuel), plutonium is reactor-grade plutonium. In addition to plutonium-239, which is highly suitable for building nuclear weapons, it contains large amounts of undesirable contaminants: plutonium-240, plutonium-241, and plutonium-238. These isotopes are extremely difficult to separate, and more cost-effective ways of obtaining fissile material exist (e.g., uranium enrichment or dedicated plutonium production reactors). High-level waste is full of highly radioactive fission products, most of which are relatively short-lived. This is a concern since if the waste is stored, perhaps in deep geological storage, over many years the fission products decay, decreasing the radioactivity of the waste and making the plutonium easier to access. The undesirable contaminant Pu-240 decays faster than the Pu-239, and thus the quality of the bomb material increases with time (although its quantity decreases during that time as well). Thus, some have argued, as time passes, these deep storage areas have the potential to become "plutonium mines", from which material for nuclear weapons can be acquired with relatively little difficulty. Critics of the latter idea have pointed out the difficulty of recovering useful material from sealed deep storage areas makes other methods preferable. Specifically, the high radioactivity and heat (80 C in surrounding rock) greatly increases the difficulty of mining a storage area, and the enrichment methods required have high capital costs. Pu-239 decays to U-235 which is suitable for weapons and which has a very long half-life (roughly 109 years). Thus plutonium may decay and leave uranium-235. However, modern reactors are only moderately enriched with U-235 relative to U-238, so the U-238 continues to serve as a denaturation agent for any U-235 produced by plutonium decay. One solution to this problem is to recycle the plutonium and use it as a fuel e.g. in fast reactors. In pyrometallurgical fast reactors, the separated plutonium and uranium are contaminated by actinides and cannot be used for nuclear weapons. Waste from nuclear weapons decommissioning is unlikely to contain much beta or gamma activity other than tritium and americium. It is more likely to contain alpha-emitting actinides such as Pu-239 which is a fissile material used in bombs, plus some material with much higher specific activities, such as Pu-238 or Po. In the past the neutron trigger for an atomic bomb tended to be beryllium and a high activity alpha emitter such as polonium; an alternative to polonium is Pu-238. For reasons of national security, details of the design of modern bombs are normally not released to the open literature. Some designs might contain a radioisotope thermoelectric generator using Pu-238 to provide a long lasting source of electrical power for the electronics in the device. It is likely that the fissile material of an old bomb which is due for refitting will contain decay products of the plutonium isotopes used in it, these are likely to include U-236 from Pu-240 impurities, plus some U-235 from decay of the Pu-239; due to the relatively long half-life of these Pu isotopes, these wastes from radioactive decay of bomb core material would be very small, and in any case, far less dangerous (even in terms of simple radioactivity) than the Pu-239 itself. The beta decay of Pu-241 forms Am-241; the in-growth of americium is likely to be a greater problem than the decay of Pu-239 and Pu-240 as the americium is a gamma emitter (increasing external-exposure to workers) and is an alpha emitter which can cause the generation of heat. The plutonium could be separated from the americium by several different processes; these would include pyrochemical processes and aqueous/organic solvent extraction. A truncated PUREX type extraction process would be one possible method of making the separation. Naturally occurring uranium is not fissile because it contains 99.3% of U-238 and only 0.7% of U-235. Due to historic activities typically related to radium industry, uranium mining, and military programs, numerous sites contain or are contaminated with radioactivity. In the United States alone, the Department of Energy states there are "millions of gallons of radioactive waste" as well as "thousands of tons of spent nuclear fuel and material" and also "huge quantities of contaminated soil and water." Despite copious quantities of waste, the DOE has stated a goal of cleaning all presently contaminated sites successfully by 2025. The Fernald, Ohio site for example had "31 million pounds of uranium product", "2.5 billion pounds of waste", "2.75 million cubic yards of contaminated soil and debris", and a "223 acre portion of the underlying Great Miami Aquifer had uranium levels above drinking standards." The United States has at least 108 sites designated as areas that are contaminated and unusable, sometimes many thousands of acres. DOE wishes to clean or mitigate many or all by 2025, using the recently developed method of geomelting, however the task can be difficult and it acknowledges that some may never be completely remediated. In just one of these 108 larger designations, Oak Ridge National Laboratory, there were for example at least "167 known contaminant release sites" in one of the three subdivisions of the 37,000-acre (150 km2) site. Some of the U.S. sites were smaller in nature, however, cleanup issues were simpler to address, and DOE has successfully completed cleanup, or at least closure, of several sites. Industrial source waste can contain alpha, beta, neutron or gamma emitters. Gamma emitters are used in radiography while neutron emitting sources are used in a range of applications, such as oil well logging. Annual release of uranium and thorium radioisotopes from coal combustion, predicted by ORNL to cumulatively amount to 2.9 million tons over the 1937–2040 period, from the combustion of an estimated 637 billion tons of coal worldwide. Substances containing natural radioactivity are known as NORM (Naturally occurring radioactive material). After human processing that exposes or concentrates this natural radioactivity (such as mining bringing coal to the surface or burning it to produce concentrated ash), it becomes technologically enhanced naturally occurring radioactive material (TENORM). A lot of this waste is alpha particle-emitting matter from the decay chains of uranium and thorium. The main source of radiation in the human body is potassium-40 (40K), typically 17 milligrams in the body at a time and 0.4 milligrams/day intake. Most rocks, due to their components, have a low level of radioactivity. Usually ranging from 1 millisievert (mSv) to 13 mSv annually depending on location, average radiation exposure from natural radioisotopes is 2.0 mSv per person a year worldwide. This makes up the majority of typical total dosage (with mean annual exposure from other sources amounting to 0.6 mSv from medical tests averaged over the whole populace, 0.4 mSv from cosmic rays, 0.005 mSv from the legacy of past atmospheric nuclear testing, 0.005 mSv occupational exposure, 0.002 mSv from the Chernobyl disaster, and 0.0002 mSv from the nuclear fuel cycle). TENORM is not regulated as restrictively as nuclear reactor waste, though there are no significant differences in the radiological risks of these materials. Residues from the oil and gas industry often contain radium and its decay products. The sulfate scale from an oil well can be very radium rich, while the water, oil and gas from a well often contain radon. The radon decays to form solid radioisotopes which form coatings on the inside of pipework. In an oil processing plant the area of the plant where propane is processed is often one of the more contaminated areas of the plant as radon has a similar boiling point to propane. Classifications of radioactive waste varies by country. The IAEA, which publishes the Radioactive Waste Safety Standards (RADWASS), also plays a significant role. Uranium tailings are waste by-product materials left over from the rough processing of uranium-bearing ore. They are not significantly radioactive. Mill tailings are sometimes referred to as 11(e)2 wastes, from the section of the Atomic Energy Act of 1946 that defines them. Uranium mill tailings typically also contain chemically hazardous heavy metal such as lead and arsenic. Vast mounds of uranium mill tailings are left at many old mining sites, especially in Colorado, New Mexico, and Utah. Although mill tailings are not very radioactive, they have long half-lives. Mill tailings often contain radium, thorium and trace amounts of uranium. Low level waste (LLW) is generated from hospitals and industry, as well as the nuclear fuel cycle. Low-level wastes include paper, rags, tools, clothing, filters, and other materials which contain small amounts of mostly short-lived radioactivity. Materials that originate from any region of an Active Area are commonly designated as LLW as a precautionary measure even if there is only a remote possibility of being contaminated with radioactive materials. Such LLW typically exhibits no higher radioactivity than one would expect from the same material disposed of in a non-active area, such as a normal office block. Example LLW includes wiping rags, mops, medical tubes, laboratory animal carcasses, and more. Some high-activity LLW requires shielding during handling and transport but most LLW is suitable for shallow land burial. To reduce its volume, it is often compacted or incinerated before disposal. Low-level waste is divided into four classes: class A, class B, class C, and Greater Than Class C (GTCC). 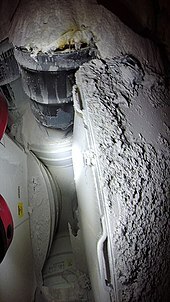 Intermediate-level waste (ILW) contains higher amounts of radioactivity and in general require shielding, but not cooling. Intermediate-level wastes includes resins, chemical sludge and metal nuclear fuel cladding, as well as contaminated materials from reactor decommissioning. It may be solidified in concrete or bitumen for disposal. As a general rule, short-lived waste (mainly non-fuel materials from reactors) is buried in shallow repositories, while long-lived waste (from fuel and fuel reprocessing) is deposited in geological repository. U.S. regulations do not define this category of waste; the term is used in Europe and elsewhere. High-level waste (HLW) is produced by nuclear reactors. The exact definition of HLW differs internationally. After a nuclear fuel rod serves one fuel cycle and is removed from the core, it is considered HLW. Fuel rods contain fission products and transuranic elements generated in the reactor core. Spent fuel is highly radioactive and often hot. HLW accounts for over 95 percent of the total radioactivity produced in the process of nuclear electricity generation. The amount of HLW worldwide is currently increasing by about 12,000 metric tons every year, which is the equivalent to about 100 double-decker buses (~200 single-decker buses) or a two-story structure with a footprint the size of a basketball court. A 1000-MW nuclear power plant produces about 27 tonnes of spent nuclear fuel (unreprocessed) every year. In 2010, there was very roughly estimated to be stored some 250,000 tons of nuclear HLW, that does not include amounts that have escaped into the environment from accidents or tests. Japan estimated to hold 17,000 tons of HLW in storage in 2015. HLW have been shipped to other countries to be stored or reprocessed, and in some cases, shipped back as active fuel. The radioactive waste from spent fuel rods consist primarily of cesium-137 and strontium-90, but it may also include plutonium, which can be considered a transuranic waste. The half-lives of these radioactive elements can differ quite extremely. Some elements, such as cesium-137 and strontium-90 have half-lives of approximately 30 years. Meanwhile, plutonium has a half-life of that can stretch to as long as 24,000 years. The ongoing controversy over high-level radioactive waste disposal is a major constraint on the nuclear power's global expansion. Most scientists agree that the main proposed long-term solution is deep geological burial, either in a mine or a deep borehole. However, almost six decades after commercial nuclear energy began, no government has succeeded in opening such a repository for civilian high-level nuclear waste, although Finland is in the advanced stage of the construction of such facility, the Onkalo spent nuclear fuel repository. Reprocessing or recycling spent nuclear fuel options already available or under active development still generate waste and so are not a total solution, but can reduce the sheer quantity of waste, and there are many such active programs worldwide. Deep geological burial remains the only responsible way to deal with high-level nuclear waste. The Morris Operation is currently the only de facto high-level radioactive waste storage site in the United States. Transuranic waste (TRUW) as defined by U.S. regulations is, without regard to form or origin, waste that is contaminated with alpha-emitting transuranic radionuclides with half-lives greater than 20 years and concentrations greater than 100 nCi/g (3.7 MBq/kg), excluding high-level waste. Elements that have an atomic number greater than uranium are called transuranic ("beyond uranium"). Because of their long half-lives, TRUW is disposed more cautiously than either low- or intermediate-level waste. In the U.S., it arises mainly from weapons production, and consists of clothing, tools, rags, residues, debris and other items contaminated with small amounts of radioactive elements (mainly plutonium). Under U.S. law, transuranic waste is further categorized into "contact-handled" (CH) and "remote-handled" (RH) on the basis of the radiation dose rate measured at the surface of the waste container. CH TRUW has a surface dose rate not greater than 200 mrem per hour (2 mSv/h), whereas RH TRUW has a surface dose rate of 200 mrem/h (2 mSv/h) or greater. CH TRUW does not have the very high radioactivity of high-level waste, nor its high heat generation, but RH TRUW can be highly radioactive, with surface dose rates up to 1,000,000 mrem/h (10,000 mSv/h). The U.S. currently disposes of TRUW generated from military facilities at the Waste Isolation Pilot Plant (WIPP) in a deep salt formation in New Mexico. A theoretical way to reduce waste accumulation is to phase out current reactors in favour of Generation IV Reactors, which output less waste per power generated. Fast reactors can theoretically consume some existing waste. The UK's Nuclear Decommissioning Authority published a position paper in 2014 on the progress on approaches to the management of separated plutonium, which summarises the conclusions of the work that NDA shared with UK government. Of particular concern in nuclear waste management are two long-lived fission products, Tc-99 (half-life 220,000 years) and I-129 (half-life 15.7 million years), which dominate spent fuel radioactivity after a few thousand years. The most troublesome transuranic elements in spent fuel are Np-237 (half-life two million years) and Pu-239 (half-life 24,000 years). Nuclear waste requires sophisticated treatment and management to successfully isolate it from interacting with the biosphere. This usually necessitates treatment, followed by a long-term management strategy involving storage, disposal or transformation of the waste into a non-toxic form. Governments around the world are considering a range of waste management and disposal options, though there has been limited progress toward long-term waste management solutions. "Long term above ground storage", not implemented. "Disposal in outer space" (for instance, inside the Sun), not implemented - as it would be currently too expensive. "Deep borehole disposal", not implemented. "Disposal at subduction zones", not implemented. "Ocean disposal", used to be done by the USSR, the United Kingdom, Switzerland, the United States, Belgium, France, The Netherlands, Japan, Sweden, Russia, Germany, Italy and South Korea. (1954–93) This is no longer permitted by international agreements. "Sub seabed disposal", not implemented, not permitted by international agreements. "Direct injection", done by USSR and USA. Nuclear transmutation, using lasers to cause beta decay to convert the unstable atoms to those with shorter half-lives. In the US, waste management policy completely broke down with the ending of work on the incomplete Yucca Mountain Repository. At present there are 70 nuclear power plant sites where spent fuel is stored. A Blue Ribbon Commission was appointed by President Obama to look into future options for this and future waste. A deep geological repository seems to be favored. Long-term storage of radioactive waste requires the stabilization of the waste into a form which will neither react nor degrade for extended periods. It is theorized that one way to do this might be through vitrification. Currently at Sellafield the high-level waste (PUREX first cycle raffinate) is mixed with sugar and then calcined. Calcination involves passing the waste through a heated, rotating tube. The purposes of calcination are to evaporate the water from the waste, and de-nitrate the fission products to assist the stability of the glass produced. The 'calcine' generated is fed continuously into an induction heated furnace with fragmented glass. The resulting glass is a new substance in which the waste products are bonded into the glass matrix when it solidifies. As a melt, this product is poured into stainless steel cylindrical containers ("cylinders") in a batch process. When cooled, the fluid solidifies ("vitrifies") into the glass. After being formed, the glass is highly resistant to water. After filling a cylinder, a seal is welded onto the cylinder head. The cylinder is then washed. After being inspected for external contamination, the steel cylinder is stored, usually in an underground repository. In this form, the waste products are expected to be immobilized for thousands of years. The glass inside a cylinder is usually a black glossy substance. All this work (in the United Kingdom) is done using hot cell systems. Sugar is added to control the ruthenium chemistry and to stop the formation of the volatile RuO4 containing radioactive ruthenium isotopes. In the West, the glass is normally a borosilicate glass (similar to Pyrex), while in the former Soviet bloc it is normal to use a phosphate glass. The amount of fission products in the glass must be limited because some (palladium, the other Pt group metals, and tellurium) tend to form metallic phases which separate from the glass. Bulk vitrification uses electrodes to melt soil and wastes, which are then buried underground. In Germany a vitrification plant is in use; this is treating the waste from a small demonstration reprocessing plant which has since been closed down. It is common for medium active wastes in the nuclear industry to be treated with ion exchange or other means to concentrate the radioactivity into a small volume. The much less radioactive bulk (after treatment) is often then discharged. For instance, it is possible to use a ferric hydroxide floc to remove radioactive metals from aqueous mixtures. After the radioisotopes are absorbed onto the ferric hydroxide, the resulting sludge can be placed in a metal drum before being mixed with cement to form a solid waste form. In order to get better long-term performance (mechanical stability) from such forms, they may be made from a mixture of fly ash, or blast furnace slag, and Portland cement, instead of normal concrete (made with Portland cement, gravel and sand). The Australian Synroc (synthetic rock) is a more sophisticated way to immobilize such waste, and this process may eventually come into commercial use for civil wastes (it is currently being developed for US military wastes). Synroc was invented by Prof Ted Ringwood (a geochemist) at the Australian National University. The Synroc contains pyrochlore and cryptomelane type minerals. The original form of Synroc (Synroc C) was designed for the liquid high level waste (PUREX raffinate) from a light water reactor. The main minerals in this Synroc are hollandite (BaAl2Ti6O16), zirconolite (CaZrTi2O7) and perovskite (CaTiO3). The zirconolite and perovskite are hosts for the actinides. The strontium and barium will be fixed in the perovskite. The caesium will be fixed in the hollandite. The time frame in question when dealing with radioactive waste ranges from 10,000 to 1,000,000 years, according to studies based on the effect of estimated radiation doses. Researchers suggest that forecasts of health detriment for such periods should be examined critically. Practical studies only consider up to 100 years as far as effective planning and cost evaluations are concerned. Long term behavior of radioactive wastes remains a subject for ongoing research projects in geoforecasting. Dry cask storage typically involves taking waste from a spent fuel pool and sealing it (along with an inert gas) in a steel cylinder, which is placed in a concrete cylinder which acts as a radiation shield. It is a relatively inexpensive method which can be done at a central facility or adjacent to the source reactor. The waste can be easily retrieved for reprocessing. On Feb. 14, 2014, radioactive materials at the Waste Isolation Pilot Plant leaked from a damaged storage drum due to the use of incorrect packing material. Analysis showed the lack of a "safety culture" at the plant since its successful operation for 15 years had bred complacency. The process of selecting appropriate deep final repositories for high level waste and spent fuel is now under way in several countries with the first expected to be commissioned some time after 2010. The basic concept is to locate a large, stable geologic formation and use mining technology to excavate a tunnel, or large-bore tunnel boring machines (similar to those used to drill the Channel Tunnel from England to France) to drill a shaft 500 metres (1,600 ft) to 1,000 metres (3,300 ft) below the surface where rooms or vaults can be excavated for disposal of high-level radioactive waste. The goal is to permanently isolate nuclear waste from the human environment. Many people remain uncomfortable with the immediate stewardship cessation of this disposal system, suggesting perpetual management and monitoring would be more prudent. Because some radioactive species have half-lives longer than one million years, even very low container leakage and radionuclide migration rates must be taken into account. Moreover, it may require more than one half-life until some nuclear materials lose enough radioactivity to cease being lethal to living things. A 1983 review of the Swedish radioactive waste disposal program by the National Academy of Sciences found that country's estimate of several hundred thousand years—perhaps up to one million years—being necessary for waste isolation "fully justified." Ocean floor disposal of radioactive waste has been suggested by the finding that deep waters in the North Atlantic Ocean do not present an exchange with shallow waters for about 140 years based on oxygen content data recorded over a period of 25 years. They include burial beneath a stable abyssal plain, burial in a subduction zone that would slowly carry the waste downward into the Earth's mantle, and burial beneath a remote natural or human-made island. While these approaches all have merit and would facilitate an international solution to the problem of disposal of radioactive waste, they would require an amendment of the Law of the Sea. ""Sea" means all marine waters other than the internal waters of States, as well as the seabed and the subsoil thereof; it does not include sub-seabed repositories accessed only from land." The proposed land-based subductive waste disposal method disposes of nuclear waste in a subduction zone accessed from land and therefore is not prohibited by international agreement. This method has been described as the most viable means of disposing of radioactive waste, and as the state-of-the-art as of 2001 in nuclear waste disposal technology. Another approach termed Remix & Return would blend high-level waste with uranium mine and mill tailings down to the level of the original radioactivity of the uranium ore, then replace it in inactive uranium mines. This approach has the merits of providing jobs for miners who would double as disposal staff, and of facilitating a cradle-to-grave cycle for radioactive materials, but would be inappropriate for spent reactor fuel in the absence of reprocessing, due to the presence of highly toxic radioactive elements such as plutonium within it. Deep borehole disposal is the concept of disposing of high-level radioactive waste from nuclear reactors in extremely deep boreholes. Deep borehole disposal seeks to place the waste as much as 5 kilometres (3.1 mi) beneath the surface of the Earth and relies primarily on the immense natural geological barrier to confine the waste safely and permanently so that it should never pose a threat to the environment. The Earth's crust contains 120 trillion tons of thorium and 40 trillion tons of uranium (primarily at relatively trace concentrations of parts per million each adding up over the crust's 3 * 1019 ton mass), among other natural radioisotopes. Since the fraction of nuclides decaying per unit of time is inversely proportional to an isotope's half-life, the relative radioactivity of the lesser amount of human-produced radioisotopes (thousands of tons instead of trillions of tons) would diminish once the isotopes with far shorter half-lives than the bulk of natural radioisotopes decayed. In January 2013, Cumbria county council rejected UK central government proposals to start work on an underground storage dump for nuclear waste near to the Lake District National Park. "For any host community, there will be a substantial community benefits package and worth hundreds of millions of pounds" said Ed Davey, Energy Secretary, but nonetheless, the local elected body voted 7–3 against research continuing, after hearing evidence from independent geologists that "the fractured strata of the county was impossible to entrust with such dangerous material and a hazard lasting millennia." There have been proposals for reactors that consume nuclear waste and transmute it to other, less-harmful or shorter-lived, nuclear waste. In particular, the Integral Fast Reactor was a proposed nuclear reactor with a nuclear fuel cycle that produced no transuranic waste and in fact, could consume transuranic waste. It proceeded as far as large-scale tests, but was then canceled by the US Government. Another approach, considered safer but requiring more development, is to dedicate subcritical reactors to the transmutation of the left-over transuranic elements. An isotope that is found in nuclear waste and that represents a concern in terms of proliferation is Pu-239. The large stock of plutonium is a result of its production inside uranium-fueled reactors and of the reprocessing of weapons-grade plutonium during the weapons program. An option for getting rid of this plutonium is to use it as a fuel in a traditional Light Water Reactor (LWR). Several fuel types with differing plutonium destruction efficiencies are under study. Transmutation was banned in the US in April 1977 by President Carter due to the danger of plutonium proliferation, but President Reagan rescinded the ban in 1981. Due to the economic losses and risks, construction of reprocessing plants during this time did not resume. Due to high energy demand, work on the method has continued in the EU. This has resulted in a practical nuclear research reactor called Myrrha in which transmutation is possible. Additionally, a new research program called ACTINET has been started in the EU to make transmutation possible on a large, industrial scale. According to President Bush's Global Nuclear Energy Partnership (GNEP) of 2007, the US is now actively promoting research on transmutation technologies needed to markedly reduce the problem of nuclear waste treatment. There have also been theoretical studies involving the use of fusion reactors as so called "actinide burners" where a fusion reactor plasma such as in a tokamak, could be "doped" with a small amount of the "minor" transuranic atoms which would be transmuted (meaning fissioned in the actinide case) to lighter elements upon their successive bombardment by the very high energy neutrons produced by the fusion of deuterium and tritium in the reactor. A study at MIT found that only 2 or 3 fusion reactors with parameters similar to that of the International Thermonuclear Experimental Reactor (ITER) could transmute the entire annual minor actinide production from all of the light water reactors presently operating in the United States fleet while simultaneously generating approximately 1 gigawatt of power from each reactor. Another option is to find applications for the isotopes in nuclear waste so as to re-use them. Already, caesium-137, strontium-90 and a few other isotopes are extracted for certain industrial applications such as food irradiation and radioisotope thermoelectric generators. While re-use does not eliminate the need to manage radioisotopes, it can reduce the quantity of waste produced. The Nuclear Assisted Hydrocarbon Production Method, Canadian patent application 2,659,302, is a method for the temporary or permanent storage of nuclear waste materials comprising the placing of waste materials into one or more repositories or boreholes constructed into an unconventional oil formation. The thermal flux of the waste materials fracture the formation and alters the chemical and/or physical properties of hydrocarbon material within the subterranean formation to allow removal of the altered material. A mixture of hydrocarbons, hydrogen, and/or other formation fluids is produced from the formation. The radioactivity of high-level radioactive waste affords proliferation resistance to plutonium placed in the periphery of the repository or the deepest portion of a borehole. Breeder reactors can run on U-238 and transuranic elements, which comprise the majority of spent fuel radioactivity in the 1,000–100,000-year time span. Space disposal is attractive because it removes nuclear waste from the planet. It has significant disadvantages, such as the potential for catastrophic failure of a launch vehicle, which could spread radioactive material into the atmosphere and around the world. A high number of launches would be required because no individual rocket would be able to carry very much of the material relative to the total amount that needs to be disposed of. This makes the proposal impractical economically and it increases the risk of at least one or more launch failures. To further complicate matters, international agreements on the regulation of such a program would need to be established. Costs and inadequate reliability of modern rocket launch systems for space disposal has been one of the motives for interest in non-rocket space launch systems such as mass drivers, space elevators, and other proposals. Most countries are considerably ahead of the United States in developing plans for high-level radioactive waste disposal. Sweden and Finland are furthest along in committing to a particular disposal technology, while many others reprocess spent fuel or contract with France or Great Britain to do it, taking back the resulting plutonium and high-level waste. "An increasing backlog of plutonium from reprocessing is developing in many countries... It is doubtful that reprocessing makes economic sense in the present environment of cheap uranium." In many European countries (e.g., Britain, Finland, the Netherlands, Sweden and Switzerland) the risk or dose limit for a member of the public exposed to radiation from a future high-level nuclear waste facility is considerably more stringent than that suggested by the International Commission on Radiation Protection or proposed in the United States. European limits are often more stringent than the standard suggested in 1990 by the International Commission on Radiation Protection by a factor of 20, and more stringent by a factor of ten than the standard proposed by the US Environmental Protection Agency (EPA) for Yucca Mountain nuclear waste repository for the first 10,000 years after closure. The U.S. EPA's proposed standard for greater than 10,000 years is 250 times more permissive than the European limit. The U.S. EPA proposed a legal limit of a maximum of 3.5 millisieverts (350 millirem) each annually to local individuals after 10,000 years, which would be up to several percent of[vague] the exposure currently received by some populations in the highest natural background regions on Earth, though the U.S. DOE predicted that received dose would be much below that limit. Over a timeframe of thousands of years, after the most active short half-life radioisotopes decayed, burying U.S. nuclear waste would increase the radioactivity in the top 2000 feet of rock and soil in the United States (10 million km2) by ≈ 1 part in 10 million over the cumulative amount of natural radioisotopes in such a volume, but the vicinity of the site would have a far higher concentration of artificial radioisotopes underground than such an average. After serious opposition had arisen[where?] about plans and negotiations between Mongolia with Japan and the United States of America to build nuclear-waste facilities in Mongolia, Mongolia stopped all negotiations in September 2011. These negotiations had started after U.S. Deputy Secretary of Energy Daniel B. Poneman visited Mongolia in September, 2010. Talks took place in Washington DC between officials of Japan, the United States and Mongolia in February 2011. After this the United Arab Emirates (UAE), which wanted to buy nuclear fuel from Mongolia, joined in the negotiations. The talks were kept secret, and although The Mainichi Daily News reported on them in May, Mongolia officially denied the existence of these negotiations. However, alarmed by this news, Mongolian citizens protested against the plans, and demanded the government withdraw the plans and disclose information. The Mongolian President Tsakhiagiin Elbegdorj issued a presidential order on September 13 banning all negotiations with foreign governments or international organizations on nuclear-waste storage plans in Mongolia. The Mongolian government has accused the newspaper of distributing false claims around the world. After the presidential order, the Mongolian president fired the individual who was supposedly involved in these conversations. Authorities in Italy are investigating a 'Ndrangheta mafia clan accused of trafficking and illegally dumping nuclear waste. According to a whistleblower, a manager of the Italy's state energy research agency Enea paid the clan to get rid of 600 drums of toxic and radioactive waste from Italy, Switzerland, France, Germany, and the US, with Somalia as the destination, where the waste was buried after buying off local politicians. Former employees of Enea are suspected of paying the criminals to take waste off their hands in the 1980s and 1990s. Shipments to Somalia continued into the 1990s, while the 'Ndrangheta clan also blew up shiploads of waste, including radioactive hospital waste, sending them to the sea bed off the Calabrian coast. According to the environmental group Legambiente, former members of the 'Ndrangheta have said that they were paid to sink ships with radioactive material for the last 20 years. A few incidents have occurred when radioactive material was disposed of improperly, shielding during transport was defective, or when it was simply abandoned or even stolen from a waste store. In the Soviet Union, waste stored in Lake Karachay was blown over the area during a dust storm after the lake had partly dried out. At Maxey Flat, a low-level radioactive waste facility located in Kentucky, containment trenches covered with dirt, instead of steel or cement, collapsed under heavy rainfall into the trenches and filled with water. The water that invaded the trenches became radioactive and had to be disposed of at the Maxey Flat facility itself. In other cases of radioactive waste accidents, lakes or ponds with radioactive waste accidentally overflowed into the rivers during exceptional storms. In Italy, several radioactive waste deposits let material flow into river water, thus contaminating water for domestic use. In France, in the summer of 2008 numerous incidents happened; in one, at the Areva plant in Tricastin, it was reported that during a draining operation, liquid containing untreated uranium overflowed out of a faulty tank and about 75 kg of the radioactive material seeped into the ground and, from there, into two rivers nearby; in another case, over 100 staff were contaminated with low doses of radiation. Scavenging of abandoned radioactive material has been the cause of several other cases of radiation exposure, mostly in developing nations, which may have less regulation of dangerous substances (and sometimes less general education about radioactivity and its hazards) and a market for scavenged goods and scrap metal. The scavengers and those who buy the material are almost always unaware that the material is radioactive and it is selected for its aesthetics or scrap value. Irresponsibility on the part of the radioactive material's owners, usually a hospital, university or military, and the absence of regulation concerning radioactive waste, or a lack of enforcement of such regulations, have been significant factors in radiation exposures. For an example of an accident involving radioactive scrap originating from a hospital see the Goiânia accident. Transportation accidents involving spent nuclear fuel from power plants are unlikely to have serious consequences due to the strength of the spent nuclear fuel shipping casks. On 15 December 2011, top government spokesman Osamu Fujimura of the Japanese government admitted that nuclear substances were found in the waste of Japanese nuclear facilities. Although Japan did commit itself in 1977 to these inspections in the safeguard agreement with the IAEA, the reports were kept secret for the inspectors of the International Atomic Energy Agency. Japan did start discussions with the IAEA about the large quantities of enriched uranium and plutonium that were discovered in nuclear waste cleared away by Japanese nuclear operators. At the press conference Fujimura said: "Based on investigations so far, most nuclear substances have been properly managed as waste, and from that perspective, there is no problem in safety management," But according to him, the matter was at that moment still being investigated. The trefoil symbol used to indicate ionizing radiation. ^ "The Joint Convention". IAEA. Archived from the original on 2010-03-28. ^ Nuclear Information and Resource Service, Radioactive Waste Project Archived 2006-04-25 at the Wayback Machine. Retrieved September 2007. ^ "What about Iodine-129 – Half-Life is 15 Million Years". Berkeley Radiological Air and Water Monitoring Forum. University of California. 28 March 2011. Archived from the original on 13 May 2013. Retrieved 1 December 2012. ^ Attix, Frank (1986). Introduction to Radiological Physics and Radiation Dosimetry. New York: Wiley-VCH. pp. 2–15, 468, 474. ISBN 978-0-471-01146-0. ^ Anderson, Mary; Woessner, William (1992). Applied Groundwater Modeling. San Diego, CA: Academic Press Inc. pp. 325–327. ISBN 0-12-059485-4. ^ Plus radium (element 88). While actually a sub-actinide, it immediately precedes actinium (89) and follows a three-element gap of instability after polonium (84) where no nuclides have half-lives of at least four years (the longest-lived nuclide in the gap is radon-222 with a half life of less than four days). Radium's longest lived isotope, at 1,600 years, thus merits the element's inclusion here. ^ Specifically from thermal neutron fission of U-235, e.g. in a typical nuclear reactor. ^ Milsted, J.; Friedman, A. M.; Stevens, C. M. (1965). "The alpha half-life of berkelium-247; a new long-lived isomer of berkelium-248". Nuclear Physics. 71 (2): 299. Bibcode:1965NucPh..71..299M. doi:10.1016/0029-5582(65)90719-4. ^ This is the heaviest nuclide with a half-life of at least four years before the "Sea of Instability". ^ Excluding those "classically stable" nuclides with half-lives significantly in excess of 232Th; e.g., while 113mCd has a half-life of only fourteen years, that of 113Cd is nearly eight quadrillion years. ^ "The 2007 Recommendations of the International Commission on Radiological Protection". Annals of the ICRP. ICRP publication 103. 37 (2–4). 2007. ISBN 978-0-7020-3048-2. Archived from the original on 2012-11-16. ^ Gofman, John W. Radiation and human health. San Francisco: Sierra Club Books, 1981, 787. ^ Sancar, A. et al Molecular mechanisms of mammalian DNA repair and the DNA damage checkpoints. Washington D.C.: NIH PubMed.gov, 2004. ^ Cochran, Robert (1999). The Nuclear Fuel Cycle: Analysis and Management. La Grange Park, IL: American Nuclear Society. pp. 52–57. ISBN 0-89448-451-6. Archived from the original on 2011-10-16. ^ "Global Defence News and Defence Headlines – IHS Jane's 360". Archived from the original on 2008-07-25. ^ "Continuous Plutonium Recycling In India: Improvements in Reprocessing Technology". Archived from the original on 2011-06-06. ^ World Nuclear Association (March 2009). "Plutonium". Archived from the original on 2010-03-30. Retrieved 2010-03-18. ^ Lyman, Edwin S. (December 1994). "A Perspective on the Proliferation Risks of Plutonium Mines". Nuclear Control Institute. Archived from the original on 2015-11-25. Retrieved 2015-11-25. ^ a b c d e f U.S. Department of Energy Environmental Management Archived 2007-03-19 at the Wayback Machine – "Department of Energy Five Year Plan FY 2007-FY 2011 Volume II Archived 2007-07-05 at the Wayback Machine." Retrieved 8 April 2007. ^ "Nuclear Logging". Archived from the original on 2009-06-27. Retrieved 2009-07-07. ^ a b c d Gabbard, Alex (1993). "Coal Combustion". ORNL Review. 26 (3–4). Archived from the original on February 5, 2007. ^ "TENORM Sources | Radiation Protection | US EPA". Epa.gov. 2006-06-28. Archived from the original on 2013-05-20. Retrieved 2013-08-01. ^ "Regulation of TENORM". Tenorm.com. Archived from the original on 2013-07-23. Retrieved 2013-08-01. ^ U.S. Geological Survey, Radioactive Elements in Coal and Fly Ash: Abundance, Forms, and Environmental Significance Archived 2005-11-24 at the Wayback Machine, Fact Sheet FS-163-1997, October 1997. Retrieved September 2007. ^ Survey & Identification of NORM Contaminated Equipment Archived 2006-02-20 at the Wayback Machine. enprotec-inc.com. ^ a b c "Backgrounder on Radioactive Waste". U.S. NRC. April 3, 2017. Archived from the original on November 13, 2017. Retrieved December 3, 2017. ^ "NRC: Low-Level Waste". www.nrc.gov. Retrieved 2018-08-17. ^ Janicki, Mark (26 November 2013). "Iron boxes for ILW transport and storage". Nuclear Engineering International. Archived from the original on 2 May 2014. Retrieved 4 December 2013. ^ Rogner, H. (2010). "Nuclear Power and Stable Development". Journal of International Affairs. 64: 149. ^ "Myths and Realities of Radioactive Waste". February 2016. Archived from the original on 2016-03-13. ^ "Radioactive Waste Management". World Nuclear Association. July 2015. Archived from the original on 2016-02-01. Retrieved 2015-08-25. ^ Geere, Duncan. (2010-09-20) Where do you put 250,000 tonnes of nuclear waste? (Wired UK) Archived 2016-05-22 at the Wayback Machine. Wired.co.uk. Retrieved on 2015-12-15. ^ Humber, Yuriy (2015-07-10). "Japan's 17,000 Tons of Nuclear Waste in Search of a Home". Bloomberg. Archived from the original on 2017-05-17. ^ a b Findlay, Trevor (2010). "Nuclear Energy to 2030 and its Implications for Safety, Security and Nonproliferation: Overview" (PDF). Nuclear energy futures project. Archived (PDF) from the original on 2014-03-07. ^ "Radioactive Waste Management | Nuclear Waste Disposal". World Nuclear Association. July 2015. Archived from the original on 2016-02-01. Retrieved 2015-08-25. ^ Biello, David (Jul 29, 2011). "Presidential Commission Seeks Volunteers to Store U.S. Nuclear Waste". Scientific American. Archived from the original on 2014-02-26. ^ Brown, Paul (14 April 2004) 'Shoot it at the sun. Send it to Earth's core. What to do with nuclear waste?' Archived 2017-03-21 at the Wayback Machine, The Guardian. ^ "Ministers admit nuclear waste was dumped in sea". The Independent. London. 1997-07-01. Archived from the original on 2017-08-25. ^ a b Blue Ribbon Commission on America's Nuclear Future: Executive Summary Archived 2015-11-28 at the Wayback Machine, January 2012. ^ a b National Research Council (1996). Nuclear Wastes: Technologies for Separation and Transmutation. Washington DC: National Academy Press. ^ "Laboratory-scale vitrification and leaching of Hanford high-level waste for the purpose of simulant and glass property models validation". Archived from the original on 2009-12-31. Retrieved 2009-07-07. ^ Ojovan, M.I. ; et al. (2006). "Corrosion of nuclear waste glasses in non-saturated conditions: Time-Temperature behaviour" (PDF). Archived (PDF) from the original on 2008-06-26. Retrieved 2008-06-30. ^ OECD Nuclear Energy Agency (1994). The Economics of the Nuclear Fuel Cycle. Paris: OECD Nuclear Energy Agency. ^ Ojovan, Michael I.; Lee, William E. (2010). "Glassy Wasteforms for Nuclear Waste Immobilization". Metallurgical and Materials Transactions A. 42 (4): 837. Bibcode:2011MMTA...42..837O. doi:10.1007/s11661-010-0525-7. ^ "Waste Form Release Calculations for the 2005 Integrated Disposal Facility Performance Assessment" (PDF). PNNL-15198. Pacific Northwest National Laboratory. July 2005. Archived (PDF) from the original on 2006-10-05. Retrieved 2006-11-08. ^ Hensing, I. & Schultz, W. (1995). Economic Comparison of Nuclear Fuel Cycle Options. Cologne: Energiewirtschaftlichen Instituts. ^ Brünglinghaus, Marion. "Waste processing". Euronuclear.org. Archived from the original on 2013-08-08. Retrieved 2013-08-01. ^ Wilmarth, W.R. et al. (2004) Removal of Silicon from High Level Waste Streams via Ferric Flocculation Archived 2006-06-29 at the Wayback Machine. srs.gov. ^ World Nuclear Association, Synroc Archived 2008-12-21 at the Wayback Machine, Nuclear Issues Briefing Paper 21. Retrieved January 2009. ^ National Research Council (1995). Technical Bases for Yucca Mountain Standards. Washington, D.C.: National Academy Press. cited in "The Status of Nuclear Waste Disposal". The American Physical Society. January 2006. Archived from the original on 2008-05-16. Retrieved 2008-06-06. ^ "Public Health and Environmental Radiation Protection Standards for Yucca Mountain, Nevada; Proposed Rule" (PDF). Environmental Protection Agency. 2005-08-22. Archived (PDF) from the original on 2008-06-26. Retrieved 2008-06-06. ^ Peterson, Per; William Kastenberg; Michael Corradini. "Nuclear Waste and the Distant Future". Issues in Science and Technology. Washington, DC: National Academy of Sciences (Summer 2006). Archived from the original on 2010-07-10. ^ "Issues relating to safety standards on the geological disposal of radioactive waste" (PDF). International Atomic Energy Agency. 2001-06-22. Archived (PDF) from the original on 2008-06-26. Retrieved 2008-06-06. ^ "IAEA Waste Management Database: Report 3 – L/ILW-LL" (PDF). International Atomic Energy Agency. 2000-03-28. Archived (PDF) from the original on 2008-06-26. Retrieved 2008-06-06. ^ "Decommissioning costs of WWER-440 nuclear power plants" (PDF). International Atomic Energy Agency. November 2002. Archived (PDF) from the original on 2008-06-26. Retrieved 2008-06-06. ^ International Atomic Energy Agency, Spent Fuel and High Level Waste: Chemical Durability and Performance under Simulated Repository Conditions Archived 2008-12-16 at the Wayback Machine, IAEA-TECDOC-1563, October 2007. ^ "Fact Sheet on Dry Cask Storage of Spent Nuclear Fuel". NRC. May 7, 2009. Archived from the original on August 5, 2011. Retrieved 2011-06-25. ^ Cameron L. Tracy, Megan K. Dustin & Rodney C. Ewing, Policy: Reassess New Mexico's nuclear-waste repository Archived 2016-07-11 at the Wayback Machine, Nature, 13 January 2016. ^ Yates, Marshall (July 6, 1989). "DOE waste management criticized: On-site storage urged". Public Utilities Fortnightly. 124: 33. ^ Hafemeister, David W. (2007). Physics of societal issues: calculations on national security, environment, and energy. Berlin: Springer. p. 187. ISBN 0387689095. Archived from the original on 2016-04-24. ^ Shipman, J.T. ; Wison J.D. ; Todd A. (2007). An Introduction to Physical Science (10 ed.). Cengage Learning. p. 279. ISBN 978-0-618-93596-3. ^ "Dumping and Loss overview". Oceans in the Nuclear Age. Archived from the original on June 5, 2011. Retrieved March 23, 2011. ^ Rao, K. R. (25 December 2001). "Radioactive waste: The problem and its management" (PDF). Current Science. 81 (12). Archived (PDF) from the original on 16 December 2008. ^ Sevior M. (2006). "Considerations for nuclear power in Australia". International Journal of Environmental Studies. 63 (6): 859–872. doi:10.1080/00207230601047255. ^ Wainwright, Martin (30 January 2013). "Cumbria rejects underground nuclear storage dump". The Guardian. London. Archived from the original on 22 October 2013. Retrieved 1 February 2013. ^ Macalister, Terry (31 January 2013). "Cumbria sticks it to the nuclear dump lobby – despite all the carrots on offer". The Guardian. London. Archived from the original on 15 February 2014. Retrieved 1 February 2013. ^ National Policy Analysis #396: The Separations Technology and Transmutation Systems (STATS) Report: Implications for Nuclear Power Growth and Energy Sufficiency – February 2002 Archived 2008-02-17 at the Wayback Machine. Nationalcenter.org. Retrieved on 2015-12-15. ^ Freidberg, Jeffrey P. "Department of Nuclear Engineering: Reports to the President 2000–2001". Web.mit.edu. Archived from the original on 2013-05-25. Retrieved 2013-08-01. ^ "酵素でプチ断食｜成功させる秘訣は代替ドリンクにあった！". Nuclearhydrocarbons.com. Archived from the original on 2013-10-21. Retrieved 2013-08-01. ^ National Research Council (U.S.). Committee on Disposition of High-Level Radioactive Waste Through Geological Isolation (2001). Disposition of high-level waste and spent nuclear fuel: the continuing societal and technical challenges. National Academies Press. p. 122. ISBN 978-0-309-07317-2. ^ "Managing nuclear waste: Options considered". DOE Factsheets. Department of Energy: Office of Civilian Radioactive Waste Management, Yucca Mountain Project. November 2003. Archived from the original on 2009-05-15. ^ Cherkashin, Yuri (2004). "Wastes on the Sun? – System of disposal nuclear and high toxic wastes. Design". Archived from the original on 2008-03-11. Retrieved 2011-12-19. ^ Cohen, Bernard L. (1998). "Perspectives on the High Level Waste Disposal Problem". Interdisciplinary Science Reviews. 23: 193–203. Archived from the original on 2012-02-04. ^ GlobalSecurity.org, Chelyabinsk-65/Ozersk Archived 2010-09-03 at the Wayback Machine. Retrieved September 2007. ^ Reuters UK, New incident at French nuclear plant. Retrieved March 2009. ^ "'It feels like a sci-fi film' – accidents tarnish nuclear dream". The Guardian. London. 25 July 2008. Archived from the original on 2 September 2013. ^ Reuters UK, Too many French nuclear workers contaminated Archived 2009-04-02 at the Wayback Machine. Retrieved March 2009. ^ a b International Atomic Energy Agency, The radiological accident in Goiânia Archived 2011-01-20 at the Wayback Machine, 1988. Retrieved September 2007. ^ "Nuclear Flask Train Crash Test – BBC News 1984". YouTube. 1984-07-17. Archived from the original on 2013-07-06. Retrieved 2013-08-01. ^ "New Symbol Launched to Warn Public About Radiation Dangers". International Atomic Energy Agency. 2007. Archived from the original on 2007-02-17. Vandenbosch, Robert & Vandenbosch, Susanne E. (2007). Nuclear waste stalemate. Salt Lake City: University of Utah Press. ISBN 0874809037. This page was last edited on 15 April 2019, at 11:41 (UTC).